The broadening and shift coefficients of more than 100 absorption lines of the ν2 + ν3 band of water vapor that are induced by the pressure of helium are measured and calculated. 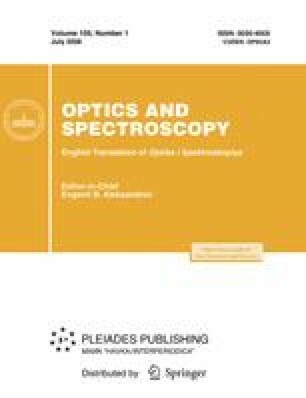 The broadening and shift coefficients are obtained from analysis of the room-temperature absorption spectra of an H2O-He mixture measured with a resolution of 0.007 cm−1 on a Fourier spectrometer in a large range of helium pressures. The specific features in the rotational dependence of the line center shifts are determined, which, in contrast to the broadening induced by other gases, are mainly positive. The calculated coefficients of the line broadening and shift of line centers are determined by a semiclassical method. An unusual dependence of the shift coefficients is explained by the rotational dependence of the intermolecular isotropic interaction potential. Original Russian Text © A.M. Solodov, V.I. Starikov, 2008, published in Optika i Spektroskopiya, 2008, Vol. 105, No. 1, pp. 19–26.